Your family has a favorable selection of hotels near Miami Port to accommodate their stay before or after your inclusive Caribbean cruise. 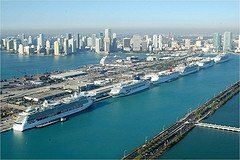 The Miami Cruise Terminal offers a wide selection of cruises to the Eastern Caribbean and the Western Caribbean. You will also find that one of your favorite Caribbean cruise lines sails out of Miami - a very busy cruise terminal. The Miami area offers many wholesome attractions that will entice your family to make staying at a hotel near Miami Port a part of your Caribbean vacation. On this page I will recommend two hotels near Miami Port and will also give you an opportunity to look at other hotels and see which online travel service has the best price for each property. TripAdvisor is a great hotel comparison service that allows you to do just that - compare prices! Address: 3900 Collins Avenue, Miami Beach, Florida. Circa 39 gets a 3.8 out of 5 rating from those who have stayed there and you can expect to pay less than $100 per night. 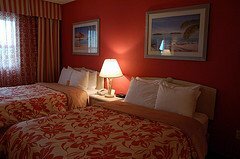 This hotel is located about 10 miles from the Miami International Airport and only 4 miles from the Miami Cruise Terminal. 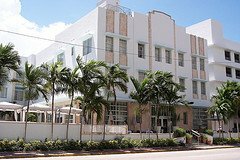 Additionally, the Circa 39 is in close proximity to many area attractions: Miami Beach is 1 mile away; Flamingo Park 2 miles; and South Beach only 3 miles away. The hotel features luxury bathrooms, a sun deck, massage service and much more. Check in from 3:00 PM. Check out prior to 12:00 PM. Address: 4333 Collins Avenue, Miami Beach, Florida. The Holiday Inn Oceanfront gets a 3.8 out of 5 rating from past guests and you will pay less than $100 per room/night. This hotel is also ideally located about 10 miles from the Miami International Airport and 4 miles from the Miami Cruise Terminal. Similarly to Circa 39, the Holiday Inn is within short distances from the Miami Beach - 1 mile; Flamingo Park - 2 miles; and South Beach - 3 miles. Other attractions such as Jungle Island is 4 miles away and the Seaquarium - 6 miles. Among its many features, the Holiday Inn offers: a swimming pool, a sundeck, a fitness room and full bathrooms. Of course there is Internet access and cable TV. I have listed only two of many hotels where your family may stay overnight before or after your inclusive Caribbean cruise from the Miami Cruise Terminal. Click here to find out what past guests say about other Miami Beach hotels at TripAdvisor, and compare rates. You may also use the TripAdvisor's amazing, hotel-price comparison service to find the right hotel at the best price in the Miami Beach area. Go right ahead. Use the search box below. The nearest airport to the Miami Cruise Terminal is the Miami International Airport, which is only 8 miles away. Depending on which hotel you plan to stay at before or after your Caribbean cruise, the airport will be about 8 or more miles away. There are two major options to choose from to get to hotels near Miami Port and both are quite economical. 1. Taxi Service: This will cost about $24 per trip (1-5 passengers) to get to the hotel. 2. Shuttle Service: Shuttle service (generally carrying several passengers) will cost about $14 per person. For the family, it is better to ride in a taxi and pay the flat fee of about $24. For additional information, you may visit the Miami International Airport's website. 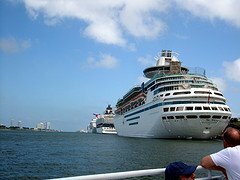 I hope that we given you some helpful information as you plan to stay at hotels near Miami Port before or after your inclusive Caribbean cruise. Click here for Bahamas cruises from Miami.